A random walk down to Sugar Sweet Sunshine and I was surprised to unexpectedly run into one of my felllow cupcake curators, Rachel. 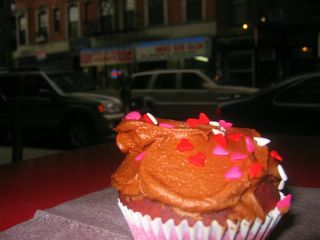 She was chatting with her friend Rachel F. I had a rich red velvet cupcake which had an almond buttercream icing. It was delicious! When it comes to cupcakes, you can be never too rich, but if you eat too many cupcakes, you won't be too thin.